As the CEO of a $4 billion technology company and chairman-elect of the World Economic Forum’s IT Governors Steering Committee, I remain vigilantly aware of our industry’s reputation. After years of solutions, apps and gadgets that produced time-saving and life-changing progress, the attention on the sector turned negative, ranging from general wariness to outright distrust. This is troubling, but arguably not too shocking given the fast, far-reaching and seismic shifts that technology has visited on life as we know it. The rate of change is neck-snapping. Today, technology is reaching deeper into our lives, ourselves and our data. With every click on a link and every search, a deeper and more nuanced digital picture of ourselves emerges. That data gets compiled and analysed and then it can be used to bring us the things we want, without our ever having expressed the desire. That is true power. Individuals and institutions depend almost entirely on technology. It underpins our economies, our critical infrastructures and our governments, and it is also integral to the daily fiber of our personal lives. Technology, and software specifically, arrived so subtly and so completely into our lives, that we never properly considered its impact. Despite its omnipresence, there is an air of mystery about technology that is unsettling to the majority of its users. According to a recent Axios/SurveyMonkey poll, 78% of respondents thought it was a "bad thing" that tech companies are able to collect so much information about their users, for fear of how it could be used. The magic of technology can now feel like sorcery and demystification is a requirement and more important than ever. The advent of technologies like artificial intelligence, machine learning and robots, and the perception of further human disenfranchisement, if mishandled, will only fuel distrust. We have reached our digital adolescence, but given the inevitability of technology in our lives, we need to consider how to evolve a more mature relationship with it. This is the moment when we must fix the relationship between apprehension and need. Neither the human race nor technology is going away, and the marriage of the two holds enormous potential for social good and human advancement on virtually every level. Software offers the promise to serve as a universal language than can build communities, bring people together and actualize ideas. As an industry, our priority must be to rebuild critical trust in technology by making it accessible to everyone. Diversity, reskilling and establishing industry best practices are three important ways we can do that. 1. Diversity – We must be relentless in our efforts to diversify the current and next generation of technologists. An inclusive environment that is accessible to anyone who would like to enter it is non-negotiable. There can be no “we” and “they” in the battle to achieve real and sustainable trust and collaboration in the industry. We only unlock our collective potential if it is just that: collective. 2. Reskilling – There is an economic win-win situation to be realized if we invest adequately to reskill today’s workforce for jobs in technology. 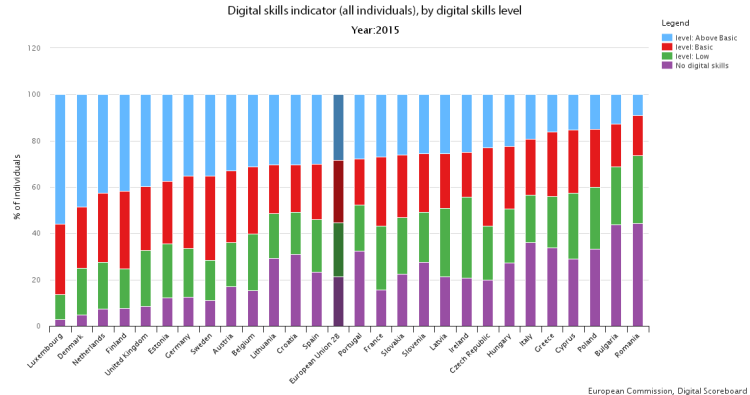 According to a Code.org study, there are 500,000 open computing jobs in the US, while the European Commission has indicated that 44% of European citizens do not have basic digital skills. Our future demands that we re-engage the talents of those marginalized by technological advances and prepare them for new roles in the Fourth Industrial Revolution. With such a large number of disenfranchised workers and open tech jobs globally, reskilling is the obvious solution. And there is an added bonus: nothing creates more goodwill than being inclusive and providing a clear path to a better life. The uptick in trust will be measurable. 3. Best practices – As the tech industry continues to mature and grow in size and importance, it is reasonable to expect that government and regulatory agencies will look to provide oversight and protections for their citizens. The European Union’s upcoming privacy law, the General Data Protection Regulation (GDPR), is an excellent example of a comprehensive and necessary approach to responsible data management and leadership. There is nothing inherently “bad” about the collection and aggregation of personal data by a company; in fact, when used to deliver customizable, value-added interactions, it is a very useful pursuit for both company and customer. But organizations need to be transparent about their data usage and build privacy (and security) into their products and services. The GDPR is therefore important legislation to ensure data is protected and trust preserved. Beyond enforceable regulation, our industry also needs to take stock of our own processes and procedures and establish best practices it will hold itself to. One simple example: a survey by CA Veracode shows that 83% of organizations release code before testing or resolving security problems, while 77% of apps have at least one known vulnerability. This, frankly, is an irresponsible and unacceptable practice, especially when testing tools are widely available and highly effective. By taking responsibility for establishing high standards and holding ourselves to them, we will ultimately protect our customers and our brands, and strengthen trust in the sector. At the end of the day, I am an optimist. My colleagues and fellow leaders in the tech industry have an exciting opportunity to leave our mark on the evolving technological landscape, even when the path ahead is not perfectly clear. We also have a serious responsibility to consider the unintended consequences; to stay focused on core human values and ethics; and to take all the actions we can, individually and collectively, to ensure that when we look back at our work we can say we raised the game – for everyone.